If you are looking for some online solution to create slideshows then Slideful is one of the options that you must try. 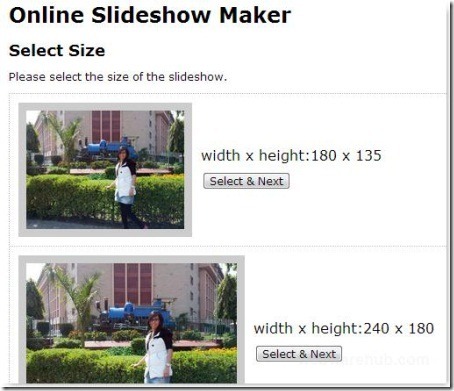 This free online slideshow maker lets you create one within minutes. The good thing is that it offers you multiple customization options and you don’t require to be an expert as most of the things are automated. All you need is to record your preferences in each step of slideshow creation wizard. Getting started with Slideful online slideshow maker is quite easy. The primary step would be to register a free account. Then after login you will be taken to a new webpage with multiple file-upload boxes. Click on ‘Choose File’ button and select an image file from your PC. The same process is to be repeated with other file-upload boxes. Once you are done with file selection then wait a while for images to upload. The appearance of thumbnail confirms the image has been uploaded successfully. Then click on ‘Next’ button at bottom the long page and in no time you will be redirected to another webpage to specify the dimension of slideshow. The first image will be shown to you in different sizes with an associated ‘Select & Next’ button. All images will be re-sized accordingly. In the next step you will be presented the list of all images that were uploaded by you. In right hand side of each image, you will be presented the multiple controls for customizing them individually. You can add text to image, apply animated decoration to it, Zoom-in or Zoom-out, add link, and apply a few other customization. If you have a link without text then whole picture becomes a link. In case, you are redirected to another window on selecting some option then need not to worry and continue with specifying your choices because in the end you will be redirected back to same window. To proceed, click on ‘Next’ button at bottom. Then you will be asked to select the type of frame and then prompted for specifying the type of transition. Next, comes the turn to specify the slideshow speed. Then you will be presented different player layouts to choose from. Next, Enquiry will be about desired Zoom. Finally, you will be taken to the page with visible flash based slideshow. Now, all you need is to follow the link on that page to download the slideshow animation or to get-embed code for using it online. You are not allowed to upload images with profanity, obscenity, and adult material. Also, watch that you do not violate anyone’s copyright. The slideshows with such images will be deleted soon after detection. Normally, so much is not expected from a free online slideshow maker, but Slideful is definitely an exception.